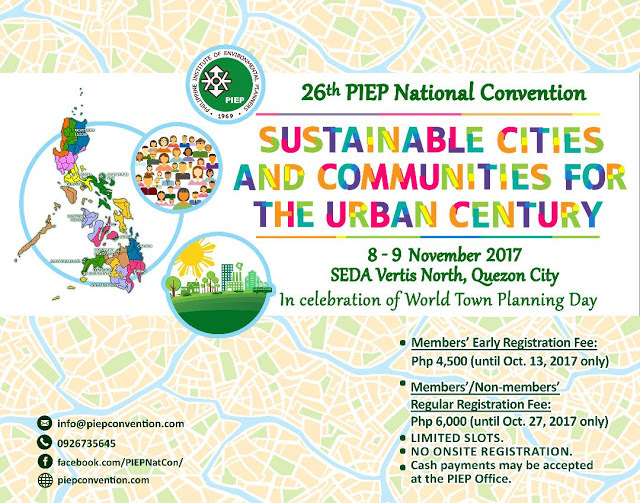 The Philippine Institute of Environmental Planners (PIEP) holds its 26th National Convention on November 8-9, 2017 at Seda Vertis North, Quezon City. The 2-day event carries the theme, “SUSTAINABLE CITIES AND COMMUNITIES FOR THE URBAN CENTURY”— highlighting the nation’s need for sound urban planning that balances considerations for socio-political, cultural, economic, and environmental issues contributing to a more sustainable development. Almost half of the Philippine population lived in urban areas as the country has become increasingly urbanized in recent decades, and apparently more so in the years ahead. However, the breadth of concrete and steel infrastructure have distanced people from the natural world, causing problems related to health and sanitation. The threat of natural calamities such as typhoons and earthquakes remains a serious concern, while the worsening traffic situation, flooding, and garbage problems continue to escalate. Building resilient cities require sustainable urban planning. The kind that envisions and promotes ample green space, multi-modal transport system, and mixed-use development that protects cultural, historic, and biodiversity resources. Sustainable urban planning ultimately creates a balance between man-made infrastructure and the natural environment. The 26th PIEP National Convention aims to raise awareness on the imperative value of environmental urban planning to a broader spectrum of decision-makers, from local to national governance perspectives. “World Town Planning Day” kicks off with Quezon City Mayor Herbert Bautista delivering the keynote on the first day, 08 November 2017 at The Quezon Grand Ballroom of Seda Vertis North, Quezon City. All Environmental Planner members of PIEP are encouraged to join, as well as national and local government units, agencies, non-government organizations, private enterprises, developers, architects, contractors, educators, the academe, and all parties interested in creating sustainable cities and communities. For online registration and more information, visit the website at www.piepconvention.com.